Historical map formed from 10 glossy 12" x 18" unmounted (heavy paper/light cardstock) map panels, 10 scenarios, 8 pages rules, 2208 die-cut counters, play aid. 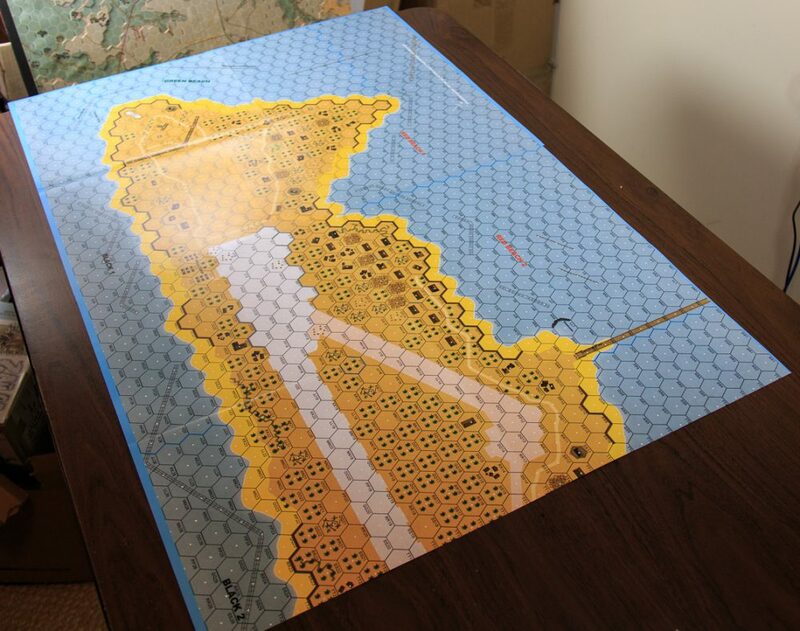 Tarawa is a large Critical Hit historical module simulating the USMC amphibious invasion of the island of Betio at Tarawa Atoll in November 1943, a shockingly bloody three-day battle against fortified and determined Japanese defenders. It is also Critical Hits attempt to ape the official ASL product Blood Reef: Tarawa published by MMP in 1999. That product has been a niche product, a bit too esoteric and complex for the “mainstream” ASL audience, but with an extremely devoted base of fans. MMP’s Tarawa has been out of print for some years, with the result that copies of the module often go for several hundred dollars when offered on E-bay. This apparently made it an attractive target for Critical Hit, which in recent years has been similarly aping other publishers’ popular ASL products, such as Pegasus Bridge and Time on Target #2. It is not a coincidence that Critical Hit came out with this ASL version of Tarawa, nor does Critical Hit pretend that it is. “Out of print, at Ebay for upwards of $400.00?” asks the Critical Hit website marketing copy for this game, “Not any more.” Indeed, Critical Hit almost makes it seem as if they are reprinting the original Tarawa from MMP. 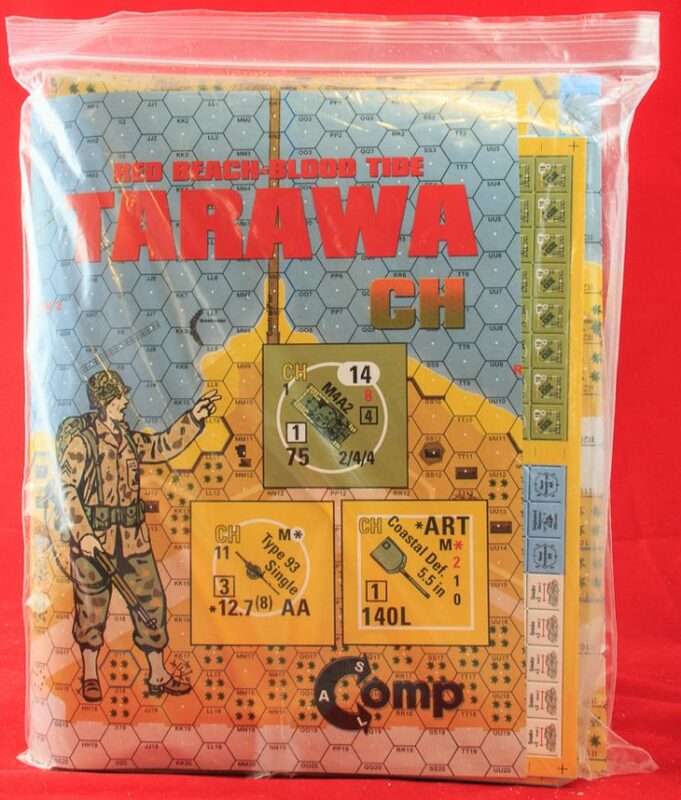 However, players expecting to get some sort of bargain will not find themselves saving very much money over E-bay prices for the real thing, as the Critical Hit Tarawa sells for $280, making it an extremely expensive wargame module (and more than twice as much as what Blood Reef Tarawa would cost were it reprinted today). CH Tarawa also follows on the heels of previous “monster” amphibious invasion-related products such as Wake: Pacific Alamo and the duo of Omaha West and Omaha East, as well as their to-be-released modules on the British D-Day beaches, giving Critical Hit something of a corner on the market of monster-sized amphibious landing ASL products. No designer is listed, which suggests that Ray Tapio was the designer. 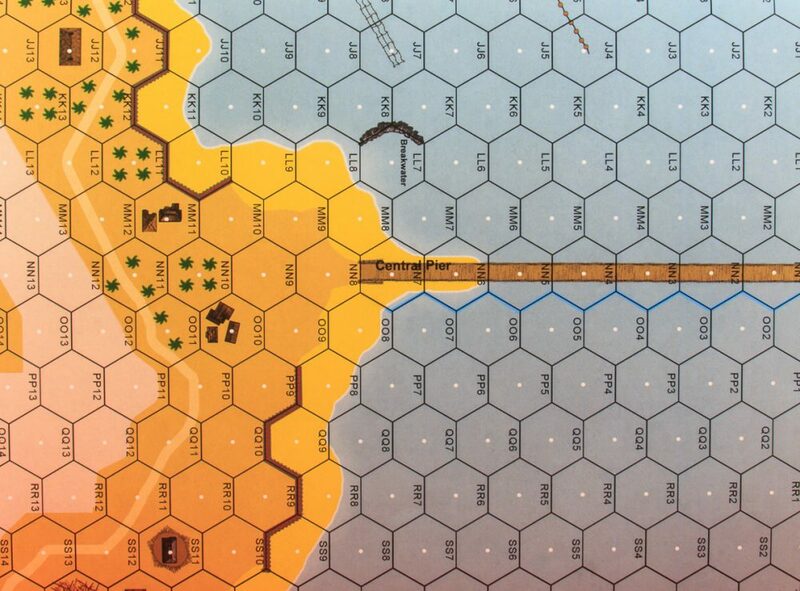 One scenario credits Dave Dally with “original concept.” This is because the scenario is a transmogrification of a geoboard-based Tarawa scenario Dally designed for Leatherneck II many years ago. All of the historical material is cribbed from other sources rather than being original. Significantly, Tarawa lists not a single person as a playtester or developed and ASLers should draw the all-too-obvious conclusions from that fact. The CH Tarawa rules often ape MMP Tarawa rules. 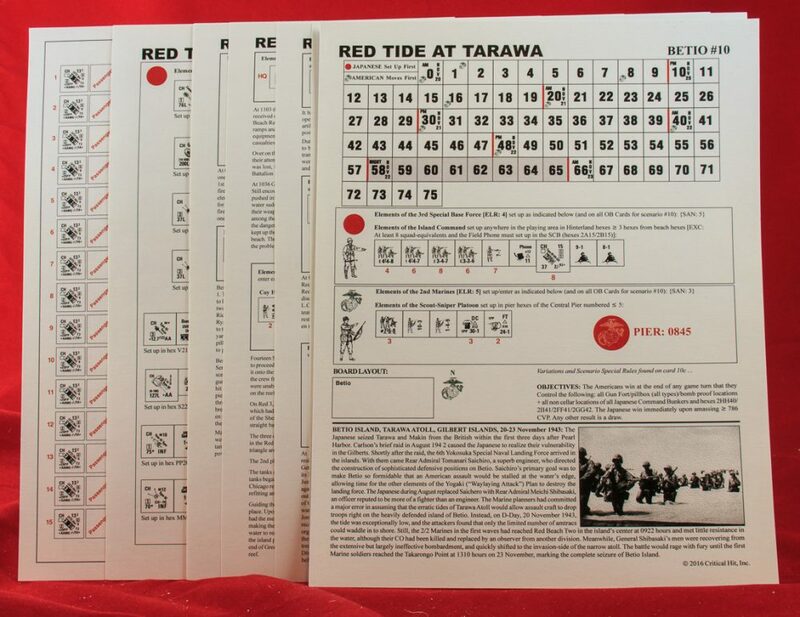 MMP Tarawa includes special counters and rules for USMC “Pathfinders;” so too does CH Tarawa. MMP Tarawa includes a rule for “Ocean-Hinterland Hindrance,” which makes it harder to hit targets at sea from inland hexes; CH Tarawa includes an “Aerosol Effects” rule doing the same thing. MMP Tarawa includes special rules for “Excavation Ditches,” while CH Tarawa has similar rules for “Excavations.” MMP Tarawa includes rules for Japanese “Command Bunkers,” and CH Tarawa follows suit. Similarly, MMP Tarawa includes an additional set of rules for the “Island Command Bunker” and CH Tarawa has a very similar “Shibasaki’s Command Bunker” set of rules, and so forth. However, CH Tarawa does have some additional rules as well, such as new Emplacements like Pre-Fab Steel Pillboxes and Bomb Proofs, as well as rules for on-map entrenchments & fortifications. There are also chrome rules to pump the USMC up even more, such as giving half-squads all the capabilities of Infantry Crews except Self-Rally and allowing USMC leaders to also act as “ordnance leaders,” providing its DRM to any To Hit attempt. They also get extra benefits when Fanatic in Beach/Ocean/Pier/Exposed Reef hexes or when manning a weapon. In addition, there are several generic rules present that CH seems to be throwing into many products featuring American troops, including Bangalore Torpedoes and Handi Talkies, as well as the generic simplified Night rules that CH now typically uses in its products. The major rules missing in CH Tarawa that were present in MMP Tarawa are the campaign game rules, because CH Tarawa does not include any campaign games (Critical Hit largely stopped making campaign games some years ago, because of the work involved in playtesting and development). Instead, CH Tarawa includes a “monster” scenario that is designed to substitute for a campaign game. It takes up many scenario cards. 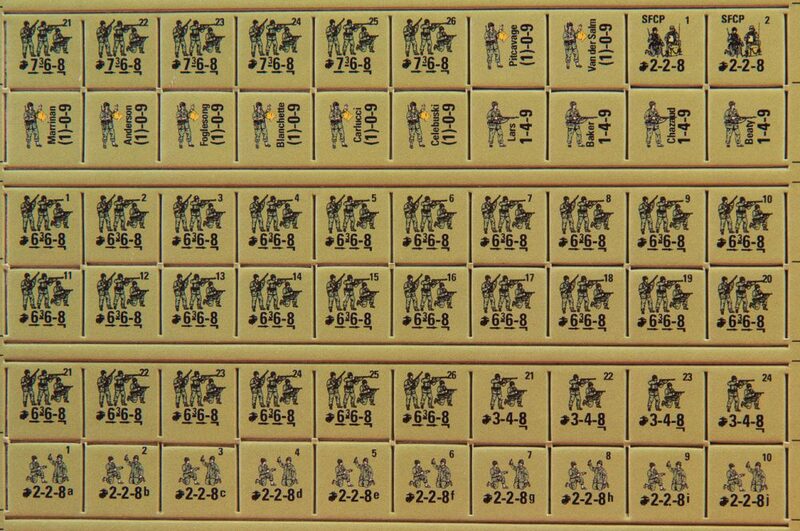 CH Tarawa comes with over 2,000 die-cut counters, which is a lot, by any measure. The bulk of these duplicate official ASL counters. 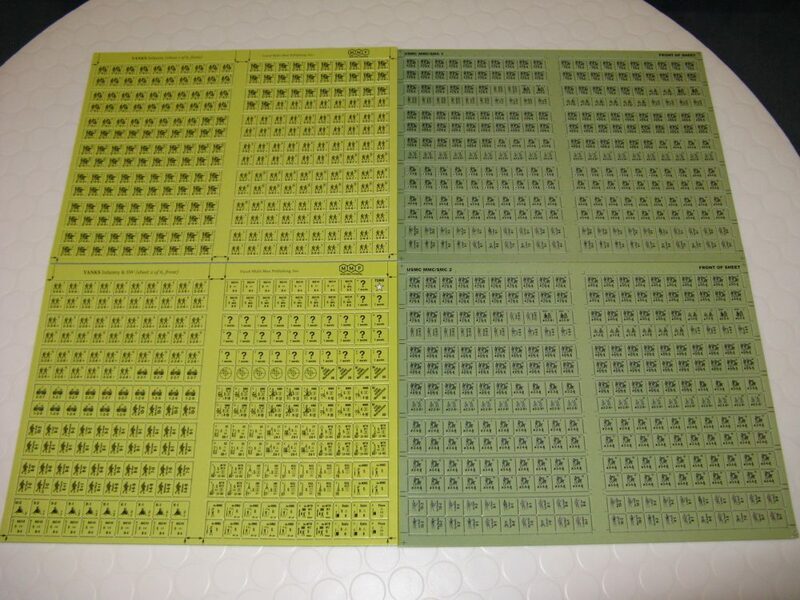 Two sheets of 280 1/2″ counters each provide USMC MMC and SMC. The two sheets appear to be duplicates of each other except for different leader names and the fact that on one sheet, 4-5-8 USMC squads and their respective half-squads were swapped out for 5-5-8 USMC squads and half-squads. On one sheet, two of the pathfinder counters are missing their little yellow flags, but this is merely a cosmetic error with no effect on play. One of the pathfinder counters is named Pitcavage, which must be some attempt at humor on Critical Hit’s part. Another sheet of 280 counters provides a wealth of US support weapons, as well as some crews and a few breach markers. 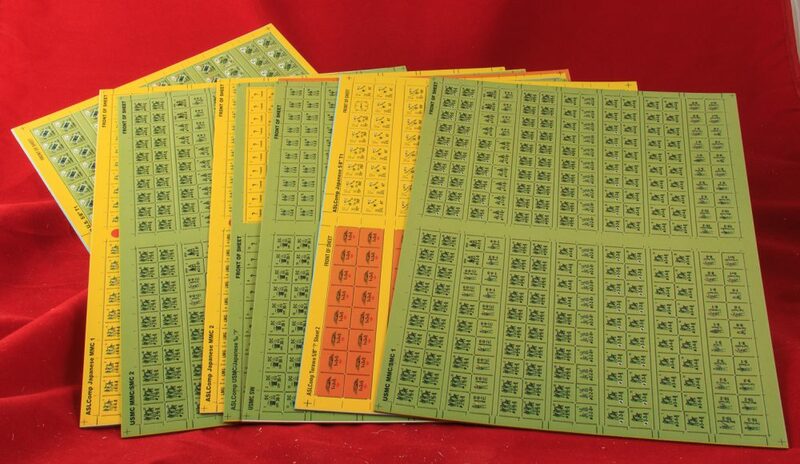 The fourth and fifth countersheets provide 1/2″ counters for the Japanese. One sheet provides squads, half-squads, and crews, while the second provides SW, SMC and more crews. A sixth countersheet provides concealment markers for both USMC and the Japanese, as well as some Acquisition markers, while the seventh similarly provides 5/8″ concealment and Acquisition markers for both sides. The eighth countersheet provides a variety of Japanese guns and a few AFVs, as well as a variety of fortification markers. The final countersheet provides USMC LVTs, tanks, and bull dozers, as well as a few guns and some assorted markers. Critical Hit did not stint on the counters. Overall they are well done, but there are two issues with them, though neither is really “major.” The first is that the die-cutting is insufficient, especially for 5/8″ counters; this has been a flaw in many recent Critical Hit products and they may need some new dies. The die-cutting does not go close enough to the edges of the counters. The second issue is the decision to provide all of the American counters not in the traditional bright green of official ASL but in an alternative dark Olive Drab color scheme. This color is indeed a bit drab, but the real issue is that the counters, with counter information printed on black over the dark green background, are a bit hard to read, especially when the lighting is not great. Some wargame publishers print Olive Drab counters with white counter information to avoid this issue, but Critical Hit did not do that. Using alternative color schemes also poses another problem, which is what do you do if the counters needed exceeds the number of alternative color counters provided? 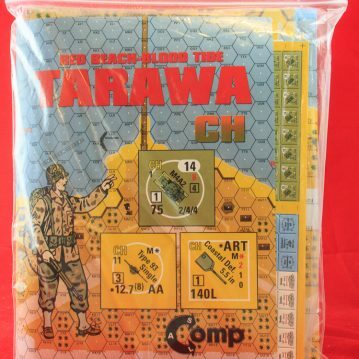 As it turns out, CH Tarawa is short several 5/8″ counters for both the USMC and the Japanese. For the Japanese, this is not really an issue, as players can dip into their stock of official counters for the remainder. However, if a player does this for the US, he will have a handful of bright green counters mismatched with all the others. This is not a dealbreaker but it is mildly irritating, as it looks as if there were sufficient space to have included these counters in the product. Critical Hit did later come out with a “bonus” countersheet (see below) with the missing counters, plus others, but it is quite expensive for a half-sheet of 88 counters. 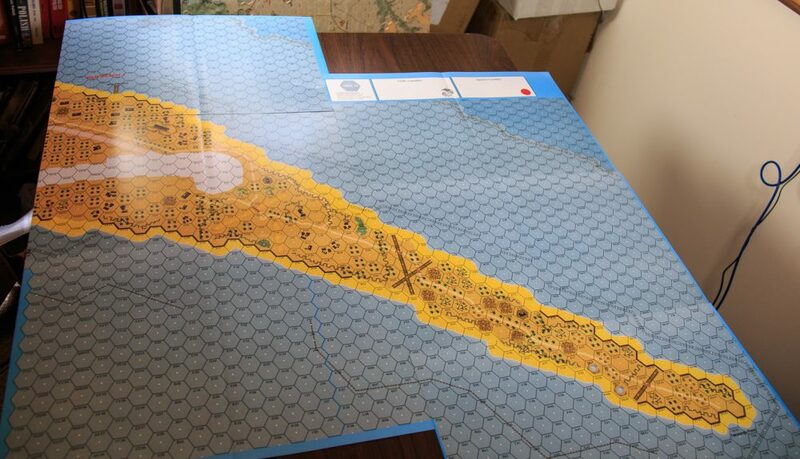 The map in CH Tarawa must be formed from 10 overlapping map panels, made of glossy light cardstock/heavy paper, that are each 12″ x 18″. Past experience has shown that assembling more than 4 of these panels is a pain, and here there are far more than that. 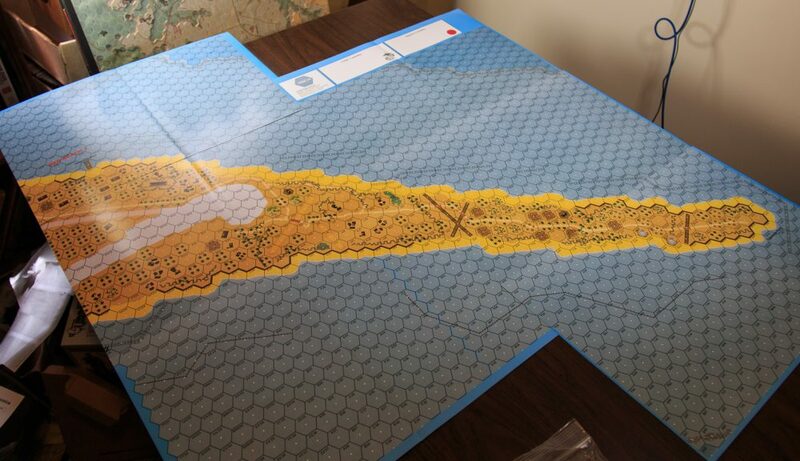 Once assembled the map is very large (it has 1″ hexes), so a lot of table space is required. The map artwork is what one might call clean and serviceable, but nothing spectacular. The map artwork of CH Tarawa cannot compare, for example, to the hand-painted map of MMP Tarawa, which provides texture and loving details such as little paths criss-crossing the island. Each building of MMP Tarawa is a unique rendering. In contrast, the CH Tarawa map contains no textures and little unique detail. The buildings are for the most part the same buildings stamped in different positions across the island. However, the on-map fortifications and entrenchments add some inherent detail to the CH map that the MMP map does not have. The CH map also includes the narrow eastern tip of the island, whereas the MMP map does not. The strangest thing about the Critical Hit map is its depiction of the runway with little rectangular protrusions sticking out to the side, every other hex, in contrast to the essentially straight lines of the runway as seen in aerial photographs. The reason why this seems to have been done was so that the center hex dots of those hexes could be covered by the runway terrain, but this was totally unnecessary; a simple rule could have provide clarification about which hexes were runway hexes, without creating a weird-looking airstrip. CH Tarawa includes 10 scenarios. Aside from the “monster” scenario, five are large in size and the remainder small or medium. Including the monster, five scenarios have OBA. Two scenarios use Night rules (or the CH “light” version of such rules, in any case). One scenario has air support. Only four scenarios actually involve sea landings; the remainder take place on the island itself. Of the scenarios, BETIO-1 (Hawkins’ Way) seems to be an attempt to ape MMP’s BRT1 (The Hawk). The two are just way too similar in design for it to be coincidence. Similarly, BETIO-7 (Schoettel’s Redemption) is an extremely transparent copy of BRT4 (Rikusentai). BETIO-5 (Killing Ground) seems to be based on BRT5 (Hell Wouldn’t Have It). The other six non-monster CH scenarios seem to be original scenarios (except for the Dave Dally adaptation). The monster scenario, BETIO-10 (Red Tide at Tarawa), is 75 turns long. 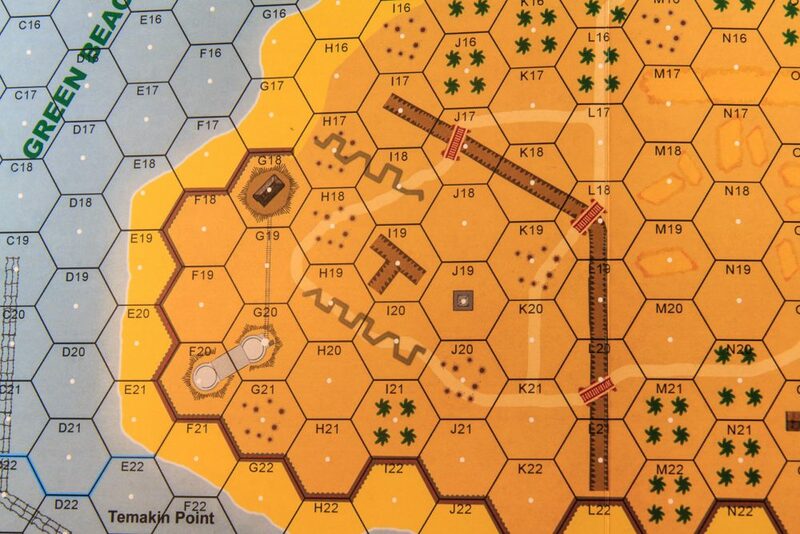 To win, the USMC player must control all Gun Fort/pillbox/bomb proof locations, as well as non-cellar locations of all Japanese Command Bunkers, plus a handful of additional hexes just to be mean. The Japanese alone get well over 100 squads, to say nothing of all their other stuff, and the USMC is correspondingly huge as well. Everything suggests that this scenario was never playtested, but for people who like “monster” scenarios, it is often the experience more than the victory that counts the most and many such monsters are not even played to completion. So this product certainly provides an extremely massive amphibious invasion opportunity for fans of the USMC or the PTO. 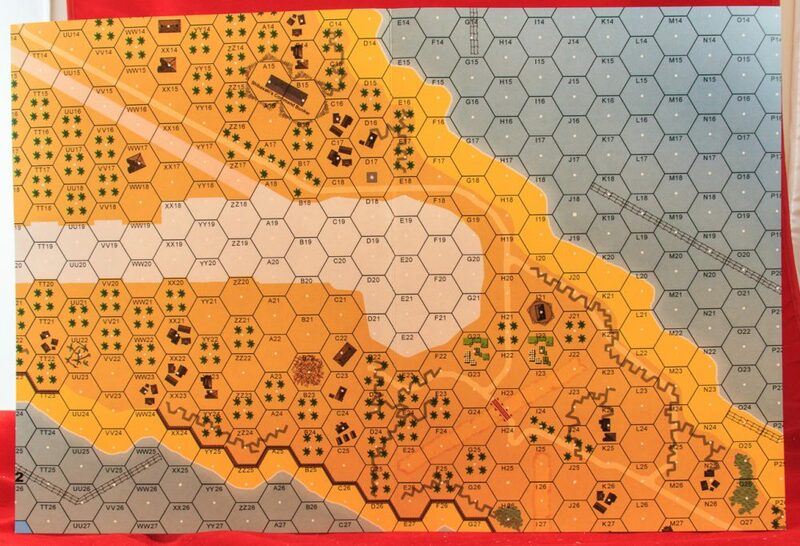 MMP’s Tarawa was very rigorously playtested and developed, and has a pool of fans so devoted that, many years after the game was published, they put together a Gamer’s Guide for it. So there is certainly no doubt that, of the two very non-coincidentally similar modules, MMP’s Tarawa is the way to go. Some, finding it hard to acquire that item, might be tempted to get Critical Hit’s Tarawa instead, but be warned that such ASLers will basically be beta testing the product. 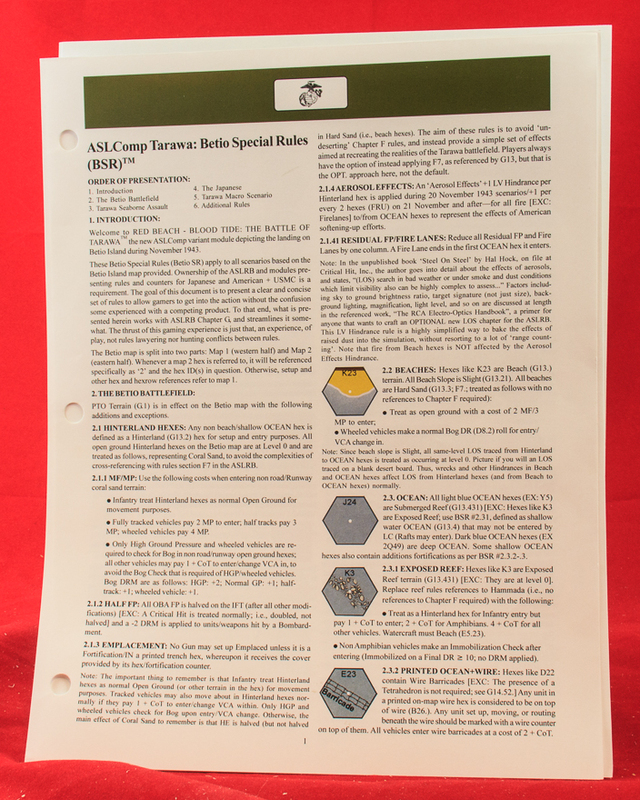 Critical Hit later released what is for them a relatively rare Errata/Q&A sheet for CH Tarawa. It is available (at the moment) on the Critical Hit website or here. 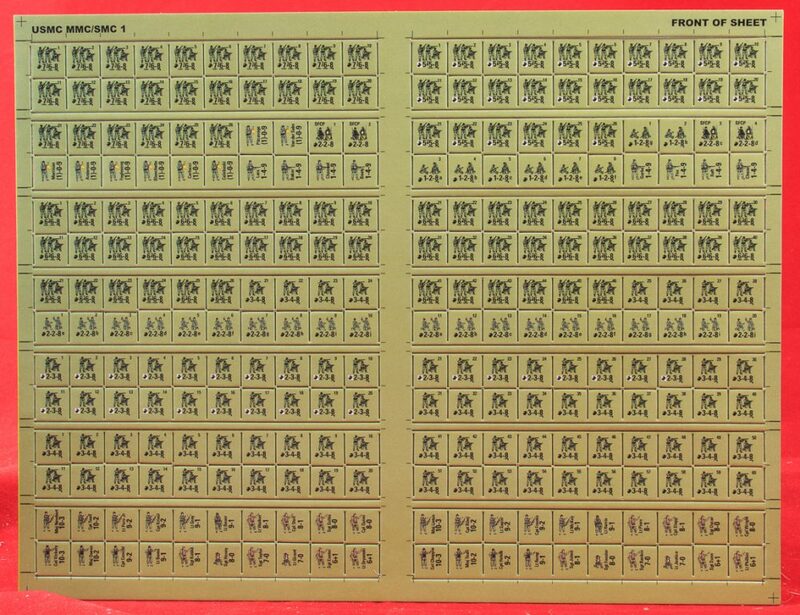 Critical Hit also subsequently released a “Bonus” countersheet for CH Tarawa, a half-sheet of 5/8″ counters (88 total) for the ridiculous price of $16.95. 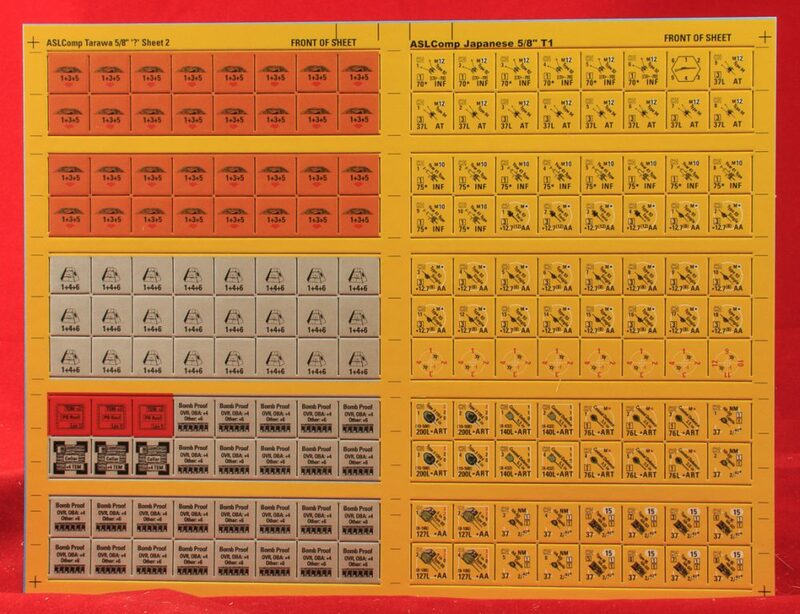 The sheet is mostly various extra information markers but it largely seems to exist because it includes needed USMC and Japanese counters, insufficient numbers of which were provided in the original product. Every time one thinks that Critical Hit can’t possibly blatantly burgalarise another product by another publisher and present it as original or authorised, the company does it again. It might be one thing if the result was an updated product but nothing of the kind emerges. It’s bad for a hobby and its fans that Tapio et al profess to care so much about. The lack of morality is breathtaking. Just as unfortunate is the reaction to input to CH, which is either purloined (emails become part of the Annual) or maligned (anyone in the least bit disappointed or dissatisfied is labeled a “whiner”). Scenarios I’ve tried to play are always clunky and usually impossible to finish, unless they’re someone else’s with a new name. It’s amazing that anyone buys their products any longer. By the way, this isn’t the first appearance of the Pitcavage counter. I’ve seen it in other games from CH, though I can’t recall where as all of my CH games are in deep storage, never to be played again. I am new to ASL, can you please tell me the significance of the “ Pitcavage “ counter? Me again…I have no idea why that angry face is on my post. I am not angry. Mark Pitcavage very frequently criticizes CH releases. Pitcavage leader counters are a friendly was to give him the raspberry. Tapio, along with other publishers, often memorialzes customers, proofreaders, and playtesters with their name on leader counters. Critical Hit "olive drab" American counters vs. MMP official American counters.